If I recall correctly, mimeograph machines used green stencils. You'd disable or remove the typewriter's ribbon, and the letters would be cut out from the rubbery plastic sheet, which became the master. Ditto machines used a two-ply master with a purple-blue waxy material on the second ply: when you typed, wax was transferred to the back of the first ply, creating a mirror image. This was then used as the master. 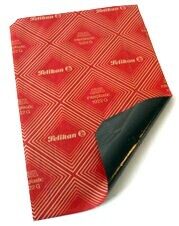 Carbon paper, as pictured here, was simply sandwiched between blank pieces of ordinary paper, and the stack was fed into the typewriter. When the keys were struck, duplicate images would be transferred to each "carbon copy" page, getting fuzzier and fuzzier the further they were from the top page. Me too! And I still remember the "tapocketa pocketa" sound of the mimeograph machine that ran off copies of tests that the teachers used to type onto the carbon copy (we called them "stencils").